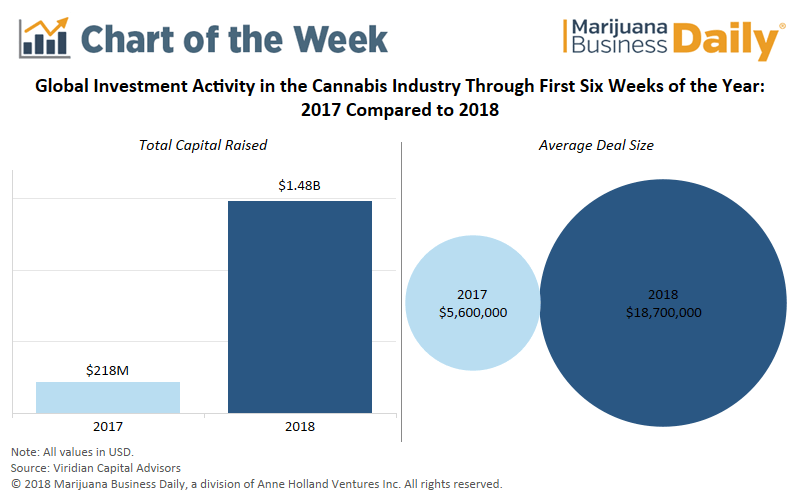 Investment activity in the cannabis industry has been increasing for several years, but 2018 is on pace to shatter previous records, as global financing in marijuana-related businesses topped $1.4 billion just six weeks into the New Year. According to Viridian Capital Advisors, a New York-based market intell igence firm focused on the cannabis industry, that represents a 580% funding increase compared to the same time in 2017. If current trends persist, marijuana-related businesses could raise nearly $13 billion by the end of 2018 – four times more than the approximately $3 billion raised in 2017. The sharp rise in cannabis industry funding is driven by investor interest in Canadian marijuana businesses. The country is set to become the first Group of Seven nation to legalize adult-use cannabis this summer. Legalizing marijuana at the federal level has given deep-pocketed, institutional investors more confidence to inject capital into Canadian-based marijuana companies, resulting in larger, more frequent funding deals. Of the 42 capital raises that took place over the past three weeks, 30 involved Canadian marijuana businesses. Globally, the number of announced capital raises in 2018 stands at 79, up from 39 at this point last year – a 103% increase. Approximately 85% of funding deals in 2018 were in exchange for equity, often by publicly traded companies selling securities. While many companies may prefer to take on debt, financial institutions remain wary of lending money to marijuana businesses. Over half the capital raised in 2018 has gone to businesses in the cultivation and retail sector. Canada’s licensed marijuana producers – which will be the sole providers of recreational marijuana in Canada once adult-use sales begin this summer – operate in this sector.